Large (and not so large) things that people or animals build to use, to live in, and to look at. 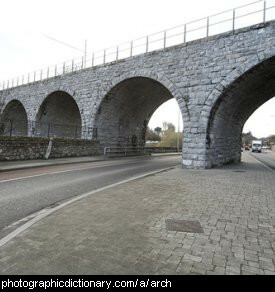 An arch is a curved, self-supporting shape usually used over doorways or to support old bridges. Arches shift the downwards force at the top of the arch to a sideways force at the bottom of the arch, so there must be a strong wall holding the base of the arch up. Arches work particularly well underground where the earth holds the sideways force. When two arches are put next to each other, the sideways forces are cancelled out, so a row of arches together e.g. under a long bridge only need thin walls or pillars holding the arches up. The stone at the top center of an arch is usually a slightly different shape, or is more decorative. It is called the keystone. 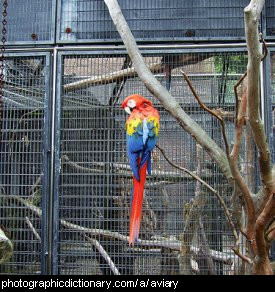 An aviary is a large cage for keeping birds in. Aviaries can be small enough to keep in your backyard, or as big as a large building. 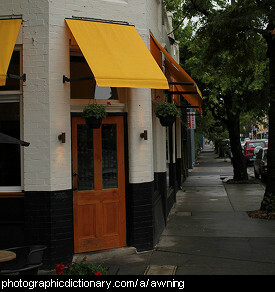 An awning is a cover over a window or door. Awnings might be solid and permanently attached, or made from a material like canvas that can be rolled up. The awnings in the picture are yellow. 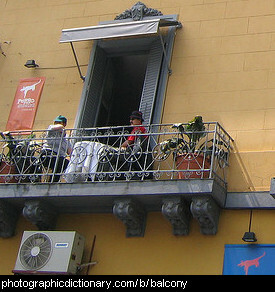 A balcony is a small platform that sticks out of the side of a building. 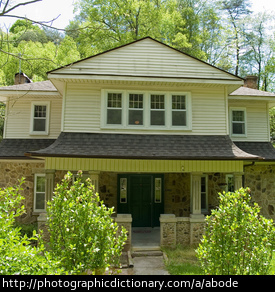 There is usually a door that leads out from the inside of the house to the balcony. Balconies are very nice to have in an apartment that doesn't have a yard. A balustrade is a kind of fence that usually surrounds stairs or a balcony. 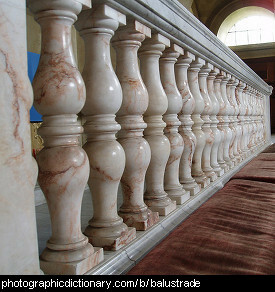 A balustrade is made up of a horizontal rail and vertical balusters. Balusters are usually quite decorative. 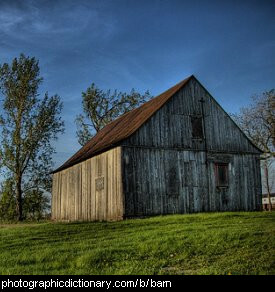 A barn is a building usually found on farms. It can be used to keep animals in, for storing hay or straw, or for storing farm machinery. 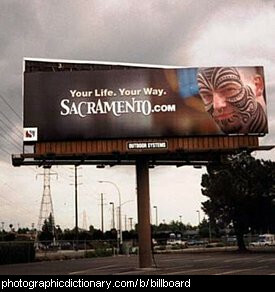 A billboard is a very, very large outdoor advertisement. Billboards are usually put near busy roads, so that people driving past in cars can see them from a long way away. 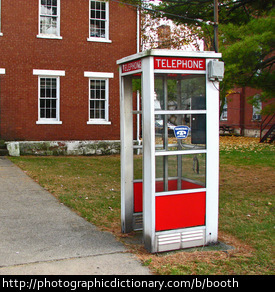 A booth is a small enclosure used for a variety of purposes, like calling someone on the phone, voting, or eating at a restaurant. 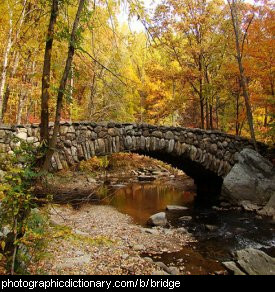 A bridge is a structure that goes over the top of something impassable so people or vehicles can get across. Bridges are usually built over chasms, rivers or other narrow bodies of water, like the narrow part of a lake or an inlet of the sea.